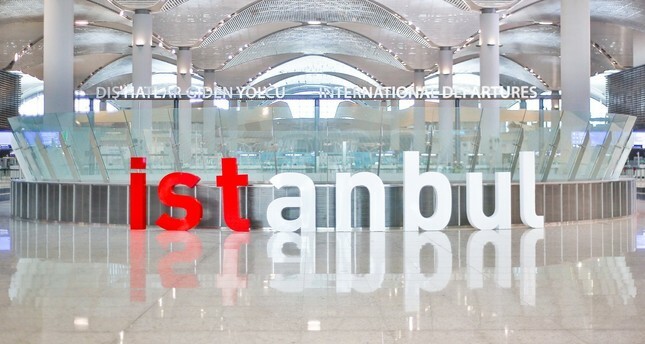 Istanbul Airport has the potential to welcome 90 million passengers annually and following completion of the second phase by 2023, the number is expected to rise to 200 million. Istanbul Airport, with its 200-million passenger capacity, will not only be the world's largest airport, but it is also the biggest information technology project in the Turkish Republic's history. It brings together the world's biggest technology companies and has showcased the potential of Turkish engineers in the IT sector. It is also the world's first airport deemed worthy of a Tier 3 data center technology certificate and has the world's most contemporary models in the field of "airport information technology." Airport officials from different parts of the world are visiting Turkey to explore this brand new model. Leading the team that marked this success is IGA Systems General Manager Ersin İnankul. He discussed how they designed this IT project with a TL 208-million budget in 2015 and how they prepared for the inauguration of the airport on Oct. 29, 2018. İnankul said that they drew the road map for the project in April 2015, with a focus on integrating information technologies into all airport operations one step at a time. "This is known as the Master System Integration in the field of airport information technology. Thanks to this design, we could build a smart airport step by step," he said. İnankul added that "You first make a list of the essentials for a smart airport. For example, building management systems and fire alarm systems are indispensable. There is also a second list including baggage claim, baggage drop, automatic baggage drop, kiosks, Wi-Fi infrastructure, services provided to passengers, inflight Wi-Fi and the design of flight screens. The third important point is where this airport must stand in terms of technology. Some 72 systems were required to make this airport the smartest on the planet. At the point we have reached so far, everything is integrated. We set up a system including smart terminal buildings, in which the relevant flight data are conveyed to us while the plane is arriving. This data keeps running until the moment the plane lands. After all the data is collected, we can automatically give an invoice before the plane turns back within two hours." He added that many airlines have so far entered the airport, which is gradually transitioning into the full-capacity mode. He said that digital systems such as automation and baggage scan are currently being tested. He pointed out that the new airport has started hosting international flights, and said: "Everything is ready on our side. We're now expecting the airline companies to flock to the airport." İnankul said that the airport IT systems were completed in 2017. "IT always take the rearmost in a quick-paced project since the completion of the building is awaited first. We made a smart move on this point and decided to establish a data center that comprises around 6,000 servers on an area of 4,000 square meters, independent of all the buildings inside. And we designated a data center for the airport only and allow for service sales in next stages. We began working on this data center in 2016 and finished it within eight months. It was the first building completed in the airport, which actually shows the importance we attach to data. We moved into the building and set up the systems in 2017. So, we were ready by July 2017. We would not have completed the airport on the scheduled time had we not built that structure and waited for the data centers. This was exemplary work. Currently, many other airports consult us and I have attended various events as a speaker. Dubai Al Maktoum is getting ready for a new airport. The first step they took was opening a tender for the data center. So, we have actually set a model," he said. Istanbul Airport, the third in the city, will replace Atatürk International Airport as the main flight hub in country's most populated city. İnankul credited the achievement to the projects multinational team that has so far established the informatics systems at 125 airports as well as the software companies, both Turkish and international, who kept up with this model during the working phase that started in 2015. "That part was challenging for us since a certain project management mindset is common in our country. We held the first meeting when we announced that we have kicked off work. We called everyone and said that we would hold weekly meetings, which everyone found absurd. But still, we called the technical staff of all the supplier software companies to weekly meetings and their general managers to monthly meetings. We set monthly goals and calculated how many people could accomplish the goals in how many hours. During the process, some companies brought the wrong hardware, and so we had to send for another delivery immediately with cargo aircraft. Some companies were left behind in software. We sent our teams to these companies, and they worked day and night. Some of them failed in the integration part. Some global-scale giant companies failed to keep pace with the integration list we projected. They brought in British and Brazilian teams. And when it did not happen, we formed a team from Turkey and assigned a colleague of ours as the team leader. We always intervened and took control of things when there were setbacks." İnankul said cybersecurity is a crucial subject for an airport, adding that they use all the software employed in the airport after giving them a cybersecurity test and they constantly conduct tests within the institution regarding malware, stemming from a method known as "phishing." He said that phishing and crypto attacks are the greatest cyberthreats that can hamper airport operations. "We cannot guarantee 100 percent security in the field of cybersecurity. Therefore, we conduct cybersecurity tests on every application we buy. We don't buy them if they fail these tests." İnankul said that Turkey has one of the smartest cybersecurity centers established in the airport and this has been the most challenging part. He added that eight people are working 24/7 in two cybersecurity centers and 10 are being trained to prevent the transmission of delicate and important information on the airport by the devices of the last users. "There are only a few people specialized in this area. So, we employed some people who we will teach and train," he added. Every morning, İnankul starts working at the airport at 7 a.m. and goes on till midnight. He does not complain about it as he thinks that the results achieved are worth all the effort. "We will provide all the services the world's best airports offer in terms of technology and comfort. Don't worry, we will be the top airport in a couple of months and receive all the awards," said İnankul. Galatasaray University, ASELSAN, İGA and Istanbul's public transport body İETT will sign a protocol for the production of a joint unmanned electric "golf buggy" and "İETT vehicle." The golf buggy will serve the passengers in the terminal. This service can be purchased via the Home to Gate (IGA Mobil) application. The other vehicle is a 12-person capacity minibus that will serve outside the terminal. The software development of the vehicles has been undertaken by İGA and Galatasaray University while the electric engine and steering systems will be developed by ASELSAN. The first prototypes of the vehicles are expected to operate in the airport within the next six months. The Home to Gate application, which will be launched at the end of this month, will make it easier for passengers to get ready for their next flight. The application organizes the time between the person leaving the house and arriving at the boarding gate. When you choose Havaist, private car or taxi options, the learning algorithms of the application connect to the Istanbul Metropolitan Municipality (İBB) and make traffic optimization, so you can adjust your pace and transportation means by checking how much time you have until the flight. As you arrive at the airport, you can share your visual history on social media platforms, see which security gates are less busy, find the locations of restaurants and stores by checking out the map and learn how to reach your gate. This application also enables you to use a golf-type electric car by buying a QR code, trace your baggage, make a quick transfer, benefit from lounge services and shop at the airport. The application also addresses foreign tourists by offering information about Istanbul. The cyber-assistant will provide flight information after a passenger scans the boarding pass. *World's First Cyber Tower: The "Cyber Tower," located in the informatics center, projects the visuals of flight platforms and runways on a curved screen thanks to 17 mega cameras, eight of them can record at resolutions up to 100 megapixels. As soon as a plane lands on the runway, the cameras project the registry numbers of the planes and all the relevant data on this screen. The Cyber Tower, which will operate 24/7, will end the era of using radio and binoculars. *Face Recognition and Biometric Pass: This will be the first airport in Turkey to employ a "digital pass," thanks to the biometric pass along with facial recognition technology. After the passenger pays the departure fee for international flights, they can drop their baggage at a certain point, attach the baggage label and trace it through a mobile application. They can scan their fingerprint after passing the security and cameras will auto-match the fingerprint and photo in the chip passport. In face recognition technology, a system named Kiwi developed by Cognitech is used. The system has 97 percent success rates and is known for distinguishing even twins. After the required permits are granted by the end of this month, 30 million Turkish citizens having chip passports will benefit from this service. *Cyber-assistant: Thanks to the cyber assistant at the entrance of the airport, the passenger can be directly connected to an airport official by pressing a single button. The cyber-assistant will provide flight information after a passenger scans the boarding pass. *Cameras: There are 10,500 cameras at the new airport in total and they can be divided into three categories. This is a very large number considering that all of Istanbul has around 20,000 surveillance cameras. Some 450 security cameras are hidden in various places around the airport can recognize among 5,000 people registered in the police databases via machine learning and alert the authorities. Security cameras that can analyze human behavior can also alert the staff of luggage and bags left unattended for more than a few minutes. Density-analysis cameras positioned at the top of the long columns at the entrance of the airport can analyze the number of people per 100 square meters and can relay heat density information to Home To Gate (IGA mobil), helping the system divert crowds to uncrowded gates. Meanwhile, face-scanning cameras are used during passport checks. *Robots: The İGA will use two types of robots for help and security purposes. There are currently five robots that help travelers at the airport and they have been specially designed by Akınsoft. The robots that have arms and hands like Pepper the robot; will be able to relay to travelers their flight information. İGA's security robots in comparison will initially have roles less visible to travelers. The number and diversity of the robots employed at the airport are expected to increase over time. *License plate recognition: The airport uses a license plate recognition technology developed by Nack. Called, Divit the system can operate with a 96 percent success rate and detect suspicious vehicles before they enter the airport parking area. *Artificial intelligence: AI will be used to determine when the runways will require maintenance. Photos taken via GPS will be used in this process. AI will also be employed in determining the temperature of critical rooms such as server rooms and depots. Algorithms will determine the optimum temperature and act accordingly to keep the rooms constantly at the right temperature. *Some 235 blue and white-collar workers within İGA, as well as workers for domestic and international supplier companies, bring the number of people working on the information systems of the Istanbul Airport to 942 in total. İGA's team has developed around 10 different software solutions. *Around 4,500 kilometers of copper and 800 kilometers of fiber optic cables have been laid at the airport.